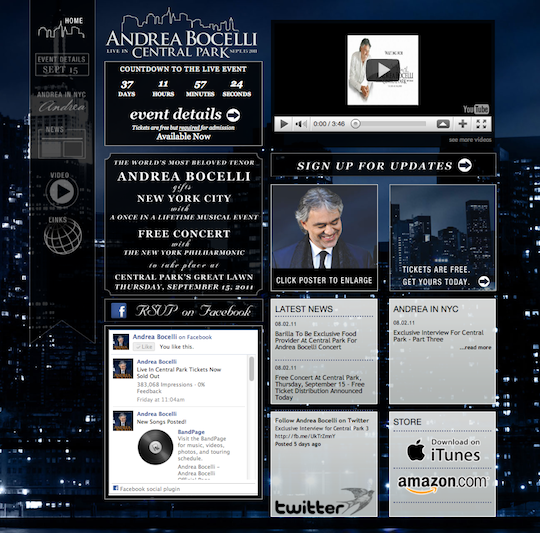 We re-aligned Bocelli’s web presence to better focus on the features of the event. In terms of design, we aimed to promote the setting of this one of a kind concert; to illustrate the beauty and mystic of NYC’s Central Park. Additionally, we made the site much more mobile and cross browser friendly for accessibility to all users. Another exciting gain in this project is that we were able to bring in over 100,000 fans on Facebook who had already stated their love for Andrea but were not part of his updates. We have even stepped in to assist in customer service to meet the demand of the large fan base that are vocal in their excitement for this event which is sure to be pure magic.